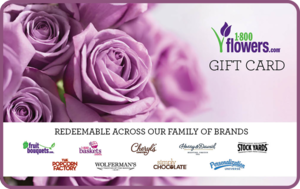 Gift-giving has never been easier with the 1-800-FLOWERS.COM® Gift Card! Browse a wide selection of fresh flowers, delicious gourmet treats and desserts, beautiful plants, stunning gift baskets and more – and then choose exactly what you want! You can use your eGift Card at any Cheryls® or Harry & David® retail stores and online at www.1800baskets.com, www.1800flowers.com, www.cheryls.com, www.fruitbouquets.com, www.harryanddavid.com, www.stockyards.com, www.thepopcornfactory.com and www.wolfermans.com. Acceptance of this card constitutes acceptance of these terms and conditions, which may change at any time. To view your eGift Card balance, go to http://freshgift.com/. This eGift Card does not expire. 1-800-FLOWERS.COM is not a sponsor of the rewards or otherwise affiliated with this company. The logos and other identifying marks attached are trademarks of and owned by each represented company and/or its affiliates. Please visit each company's website for additional terms and conditions.